Dr. Wengrove’s teaching interests include hydraulics, coastal engineering, sediment transport, turbulence and boundary layers, and engineering nature based features. Before coming to OSU in 2018 she spent almost two years doing research projects in the Netherlands and has done consulting focused in coastal wave mechanics and hydraulic dam removal. Much of her present research interest is related to the mechanics of sediment transport and hydraulic design of nature based features. Specifically, focusing on the relationship between scales of sediment transport (e.g. a ripple feeding morphologic change of a sandbar), the effects of large storm events on deep seated erosion, and the hydraulics of nature based features such as living shorelines, marsh restorations, and coastal dunes. Other research efforts are related to the effect of combined waves and currents on sediment transport, boundary layer momentum flux, and the physical mechanics of nutrient diffusion and mixing from surficial sediments. 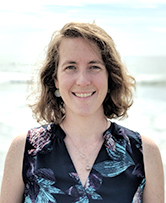 Her research has been funded by the National Science Foundation, the Office of Naval Research, Graduate Women In Science, the PADI Foundation, and Fulbright.